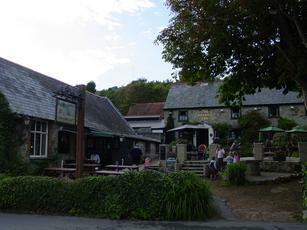 The Buddle Inn was third and last pub we visited in Niton yesterday. After visits to Joe's Bar and the White Lion, the Buddle was the busiest of the three. It's a cosy pub which clearly specialises in food. Once at the bar, we were summoned to the till for our food order to be taken. Ordering drinks instead seemed to catch them by surprise. They have a house beer called Smugglers from Timothy Taylor, alongside Landlord and Sharp's Doom Bar. There was no real cider. Popular with families, there is a roaring open fire in winter. From the front, there is a nice view across the sea. Not really a drinkers' pub. For that, head to Joe's Bar in the village's post office. Reputedly a former smugglers' inn and I can well believe it. All the character and charm you can want. Doom Bar, Bombardier and Yates' Buddle Brew were on sale - I tried the latter which was decent but probably not helped by the hot weather which caused it to lose its condition pretty quickly. Idyllic spot but the music was too loud for us to chat. Boring Doom Bar and a couple of big regional beers on offer alongside two from Yates for the bus weekend. A lovely pub set in a superb location ,3 Ales on including a local .Old Rosie Cider on tap food looked good ,also a good garden to sit out in on a summers day. I must admit I'm a Youngs man, I went to school within spitting distance of the bewery and I began drinking mild & bitter long before it was legal for me to do so. I'm also very fond of the Buddle. I don't get to visit the IOW as often as I would like but always try to get to the pub when I do. I have never been disappointed, so it was great to see Youngs London Bitter on tap and an Isle of Wight crab salad on the menu. Six bitters, including the local brews, Goddards & Yates (how I miss Burts) and my mate was suprised and delighted to see and taste Flowers Bitter, albeit on keg, but then wasn't it always?